I returned home to the Island in 2012 and have a wealth of knowledge of the island not just as a local but also returning repeatedly each year as a tourist! I will happily advise you on walks, meals out, where to go (or not go) and assist where I can to ensure you have a memorable stay..whilst giving you all the privacy you'd expect on holiday here too. The walks on the doorstep are beautiful, even in winter with stunning sunsets over the Needles from own grounds, its cup of tea time and watch the sun set even in November at 4pm ! Its impossible to describe how stunning the views are, with such a wide landscape view here. Whether its been the snow, rolling mists, the autumn and winter sunsets, the rain clouds, the views and colours to the landscape change daily. There have been many days in winter when all was so calm it looked as if someone had painted me a seascape as a backdrop from the grounds. Yet its spot the tourist here as so many seem to be put off winter breaks. But if you are looking for a rest, walking holiday his is an ideal spot. If you wish to see no one for a week its quite easy to do and just take in the winter sunsets, empty beaches for a walk. If you visit here and don't have a camera, beg and borrow before you come to stay... It really is an artists, walkers, photographers or nature lovers paradise. It also attracts many doctors, therapists and clergy here to stay, seeking that quiet week away One couple booked two weeks and said it was the most therapeutic holiday they had ever had . Its nothing short of a great retreat for someone wishing time out of the rat race, simply to meditate or to paint, walk or rest...why i always have a smile on my face living here too. 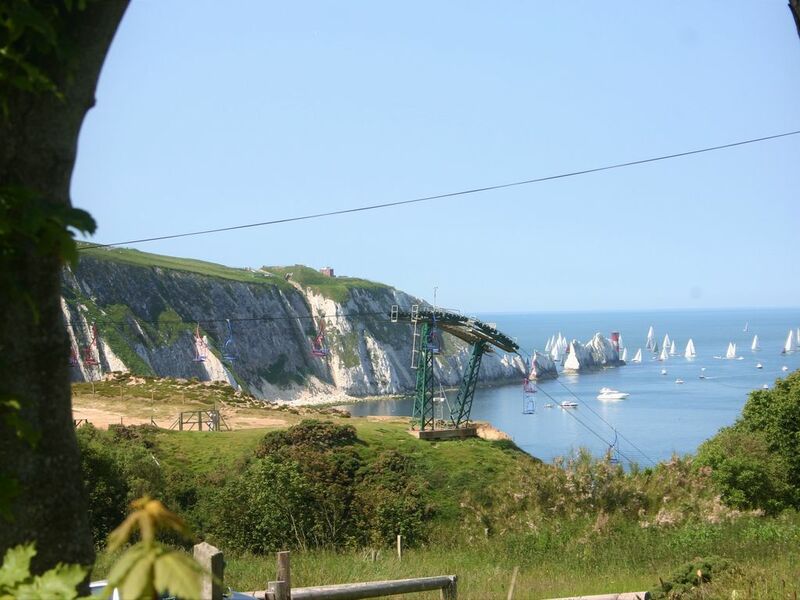 Direct access onto coastal path Direct access to footpath and under 10 mins walk to Alum Bay Beach Direct views to The Needles, Headon Warren and Tennyson Monument and The Downs from grounds. Only minutes drives away Totland and Colwell Bay, Freshwater Bay and stunning Compton Bay. I am here on site so any problems get fixed as best i can and advice on hand if you need it. The property is stunning, see pictures and the 'Why this property'. If you shoot (air rifle) you are welcome to collect your own rabbit for stew here, site is registered. We just call it in to say you are, so they know, part of country watch. Ensuite to master bedroom. Still as pristine clean as fitted 2013. Thermostatic mains pressure large shower head, with glitzy panels to walls, silver shower surround with bi-fold door. Toilet and basin. Wood flooring. Shower is 70 cm sq and so will be unsuitable for very large persons. Emergency use landline available charged at cost. Owner only control due to sensitivity of control panel. Ambient Temperature of room typically 20 degrees. Units kept on all year round. Dorma bed linen. bed made up and ready. with quality duvet and pillows,matching bedspread with extra pillows available, Two Fleeces blankets also provided to lounge to cosy up on settee. Owner can dry anything if requested, washing line provided and also indoor airer. Off road and spacious, safe space for bikes. Good clean set hand towels and bath sheets Flannels not provided. Leather 3 and 2 settee. Antique carved Dresser, chest, number tables, rocking horse.Cream Axminster design deep pile rug over wooden flooring. Books, games,. puzzles. Under counter fridge, no freezer section , chest freezer in the utility room fro yourselves only. Good range controls, not basic model ! Very nice carved Walnut solid wood table and chairs, with table cloth and protector provided. Adjacent to kitchen area, and lounge area, tv unit can be angled to watch from table. Grassed spacious area full sun and a shaded corner adjacent to shaded patio area, Table and chairs provided. Small space outside bedroom, views to needles. Available locally to hire in Yarmouth. Freshwater golf course about 5 mins away. Smoking outside property gates only . Notes on accommodation: The Old Hayloft is a beautiful, fully refurbished detached open plan cottage with separate bedroom ensuite above original Coach House. Built of stone with beams throughout offering character and quality accommodation with a home from home feel. Outside: The double doors to the apartment open direct onto secluded patio and garden area, with shade as well as to catch full sun, The path then leads up to the full grounds extending to near 3 acres. There are wild flowers, many bulbs, shrub and wildlife. Rare birds are common, with daily visits from my pheasants. Foxes, badgers and always a rabbits and green woodpeckers around...Views from the gardens and grounds are stunning, with panoramic views of The Needles, sea and countryside. A camera is a must.....I can lend you some binoculars if you d like ! Accommodation is full of character, with very good facilities, and extremely comfortable and clean. Great location with wonderful views and ideally positioned if you want to just stroll or take more energetic walks. Good connection to bus services, if you don't fancy driving, so you can explore other major attractions on the island effortlessly. The outstanding natural beauty of West Wight and local attractions is engaging but if you just want to chill out this place is excellent. Lovely accommodation in great location for coastal walks, relaxing and exploring. The Coach House is beautifully furnished and equipped. It is in a secluded, relaxing location, despite being so close to Alum Bay visitor attraction, and there are superb walks from the doorstep. The shower compartment is very small - difficult even for a slim female to manoeuvre in! Bed extremely comfortable, with luxurious bedding; I would suggest blackout lining for the bedroom curtains, please, for those of us who are light sleepers. As a long-time and regular user of self-catering properties such as this, I am used to check-in being from 3 pm onwards, but the owner here is unusual in expecting travellers to arrive AT 3 pm (often pretty difficult for people travelling from a distance on holiday). Not having seen a very inconspicuous link to a pdf in just one email months earlier, I arrived at about 5pm - after a long and difficult journey, and having had great trouble finding the property (there is no sign on the approach road, no phone connection, no printed route details, and the postcode only takes you to the main Visitor Attraction area), and the owner was very angry, rude and unprofessional, blaming me for her missing an appointment! This was extremely upsetting and surprising, as I genuinely did not realise she expected me at 3.00. (Indeed I had earlier messaged her that I was on the 4.00 ferry). I would urge the owner in future to double-check that her requirements have been seen by guests during the days shortly before their arrival, as well as providing detailed instructions on how to find the cottage, and not simply to assume that they saw and opened the pdf link. I had received no other reference to this required entry time in ANY communications nearer the booking dates, just emails promoting the HomeAway app (which did not help me with this!). An owner expecting new arrivals to their property on a Friday afternoon should ensure that they (or a stand-in if necessary) are available to greet their guests in a friendly, professional way whenever they are able to arrive. We had a very relaxing short break at the Hayloft, which had everything we would want for a self-catering cottage. Melody was very helpful with tips on where to visit locally & responded really quickly to our booking request/messages so we managed to sort our trip out quickly just 7 days in advance. West Wight has plenty to do & the Needles attractions and Alum Bay beach are just a 5-10 minute walk away. My wife and I had a great week at the Old Hayloft.Superb view of the Needles. And so peacefull.Melody the owner was great and couldn't have been more helpful.If we ever go back to the island we would definitely be looking to stay here again. One tiny negative was the size of the shower but it was ok.This was far outweighed by the positives. Would highly recommend. Thank you for taking the time to add your kind review. Its a shame the shower is only 70cm square with bi fold door for ease entry, most love the power of the shower, no drizzle of water as are many. But sadly that was the only size that would fit in the ensuite space.with it being a retaining wall between the bedroom and lounge. Maybe one day i will remodel upstairs to give larger ensuite but its a too costly alteration at this time sadly. Perfect location to enjoy a peaceful and relaxing break. A lovely welcome from the owner Melody, a very cheerful and informative lady. The Hayloft is a lovely place to stay, it is clean, comfortable and has everything you could need for your stay. The location is stunning and within a couple of minutes walk you can be on top of Headon Warren, providing lovely views of the needles and across to Bournemouth, and for those who like walking can go onto Totland and Yarmouth returning via a regular bus service. Tennyson Down is also only a short walk providing a ridge walk down to freshwater Bay and can also return by bus. For those who prefer to drive, the roads around this part of the island are good and reasonably quiet giving good access to many parts of the island. it was lovely to meet you both and thankyou fro taking the time to leave a review. I am glad my inside knowledge of the island as a returning home tourist for 27 years before coming home to live again here helped you . Its become a regular site of extra cars here while guests use the great bus service and enjoy the walks on my doorstep. One couple who stayed two weeks described my grounds here as the most relaxing two weeks stay they had ever had, with the fact they saw and heard nothing but wildlife until hey wandered out the long driveway. Very disappointing not what it I expected from the information given. As you arrive there is a fantastic view of the needles, the owner met us and was slightly abrupt. Once you leave the car park the property is adjacent to the owners, practically outside her backdoor The lovely veranda by the bedroom you are not allowed to use. The property is very long and dark, there are glass doors at either end of the property but only two other windows, one of which is fixed so un able to open and the other a velux window in the roof of the bedroom, however you are not allowed to open this widow ! therefore the property gets very stuffy during the day. The furniture is set up for six people ( armchairs and Large dinning table ) which seemed odd in a two person property. The furniture also looked like a job lot from the charity shop. The property was not very clean, full of cobwebs and actual mould around the shower base. The shower was also so small that I could not wash my hair properly and id you needed to pick something of the floor, well forget it, it was not possible to bend down and pick it up and i am only your average size 12 woman. The bed was so uncomfortable we both dreaded bed time and had the most awful weeks sleep ever. The two electric heaters are set at 17degrees and locked on asking the owner to turn the heating up because we were cold she put it up 1 degree and locked them again. Later we were again cold and so as not to disturb her again we googled how to turn them up and put them up to 20degrees. The next day the owner entered the property without our knowledge or consent and altered the temperature - a gross invasion of privacy- apparently you can not have the temp over 18degrees or the cottage gets damp, so I pity anyone going on a winter break I suggest you take a lot of jumpers because it was cold in September. There are no views from the property at all and I think the implication that there are wonderful views are deceptive there is a large holiday cottage in front of the property blocking your view you can not even see the sea from the garden. The noise from the needles site is loud and easily heard from 10-5 every day and even the view from the car park is spoilt by the cable cars running in front of it. On leaving we left the property clean and tidy but £30 was deducted from our deposit to call in the cleaner to put the bin out so make sure you put the bin out where ever the external bin may be because we never found one. Only 10 minutes from the Lymington Ferry terminal. Approx 30 minutes to Cowes or 40 mins with traffic to Fishbourne ferry. A bus stop is 5 minutes walk away and goes via Yarmouth ferry to Newport where other buses connect to all boat access to the Island. The Old Hayloft is tucked off a private road off the Alum Bay Road, just beyond Freshwater / Totland. The Old Hayloft is only about 5 mins drive to Totland /Freshwater offering an abundance of character pubs, restaurants, small supermarkets, local produce, bakers and butchers and array of small shops. Art gallery, photo shops, gift shops, florists. Yarmouth offers similar and is only 10 minutes away. Newport with it's larger array of clothes shops and the routine shops like Marks is 25/ 30 minute drive. There is also a cinema complex. Tourist Attractions : Our most Local attraction is 5 minutes walk, The Needles Pleasure Park with its chairlift down to the Beach. Calbourne Water Mill is about a 15 minute drive, passing Chessell Pottery. There are also fishing trips and other interesting boat trips available in Yarmouth. Many tourist attractions are all within 40 minutes via coastal drive. Lovely Walks: No Car! From The Old Hayloft it is possible to walk one side of the Island over The Downs, above The Needles, to Freshwater via Tennyson monument. Or the other side of our coast, over the purple clad heather warren to Totland Bay. You can even venture all the way to Yarmouth if you like a longer few hours leisurely walk. The views are stunning on this long walk and I'd say the best to be had on the Island ?! You can always choose to catch the bus back from these walks, after a lovely meal in a local restaurant or pub !